THE WORLD COMES TO MUNSON: Sister Maria Kharita from Indonesia jokes with seniors Justin Cipollone (left), Christina Judy, Jimmy Flowers, and Alec Roberts during her visit to their Theology 12 class this week. With greetings of "selamat datang"—the Indonesian words for "welcome"—our students and staff hosted three Indonesian educators this week as part of their tour of schools sponsored by our Sisters of Notre Dame throughout the United States. With about 270 million people, Indonesia is the world's 4th most populous nation. Indonesians speak more than 700 languages and dialects. 75% of all active volcanoes on Earth are in Indonesia. Sister Maria Kharita, Sister Maria Eufrasia, and Mr. Sigit Setyawan spent the entire day with us on Tuesday. After being interviewed on our daily video announcements by juniors Julia Tripodo and Sam Urbanski, the visitors toured the campus, met with administrators and teachers, and visited several classrooms. 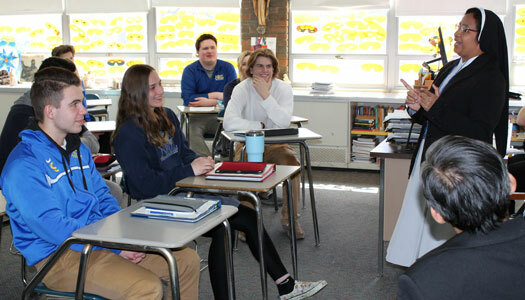 "I am so impressed by the community you have created here," Sister Kharita told the students in Theology Department Chairperson Mrs. Michelle Nowak's Theology 12 class. While in this country, the Indonesian educators will visit schools in Toledo; Covington, Kentucky; and Los Angeles and Thousand Oaks, California. Our Sisters of Notre Dame have ministered in Indonesia since 1934. Currently, 128 sisters serve in schools and other ministries throughout the South Pacific nation of more than 17,000 islands.